To be a world-class, growth-oriented electronics corporation specialised in providingquality, market-focused products, services and cost-effective system solutions to a largeclientele. To attain leadership position in the knowledge industry by training and utilizing the richknowledge capital available in Kerala, and creating a wide technology horizon for thedevelopment of knowledgewares and intelligent systems. ANYTHING is possible. But then, only few things really happen. 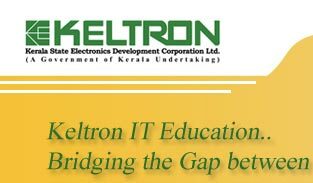 Keltron has been makingthings happen since 1973 starting with spearheading an electronics revolution in thecountry to being the most sustainable electronics corporation in the state sector. A strong infrastructure, enterprising team of people, innovative operational methods,accent on quality and customer-orientation are the core competencies of theorganization which has made things happen all these years. Large Pool of Experienced Technical ManpowerKeltron’s expertise in high quality manufacturing is the direct result of the highly skilled,multi-disciplinary team of graduate engineers, project managers and a skilled workforcewith a proven track record in complex precision manufacturing. Currently, Keltron employs a work force of 2000 of which 400 are Engineers who possessextensive hands-on experience in technology integration and adoption, high-techmanufacturing operations and in managing turn-key projects. Man power at Space Electronics section has been specially trained at Indian SpaceResearch Organization (ISRO) in high-reliability soldering, harnessing and QC. Keltron also provides technical manpower to major organisations like ONGC and VSSC ,and collaborators like Hitachi, Japan. Keltron has an All India Sales Network in place with full-fledged Marketing Offices inMumbai, Delhi, Kolkata, Chennai, Bangalore, Hyderabad, Ahmedabad and Trivandrumto provide the quickest possible service to customers. Technology Support At the moment, Keltron has an arrangement with C-DAC, a research and developmentorganization under the Government of India, which is located in the Keltron campus, fortechnology development and adaptation.An in-house research and department facility along with a full-fledged Knowledge Centre is in the pipeline and will be implemented shortly. Strong Infrastructure and Manufacturing Experience Since its inception in 1973, Keltron’s forte has always been high quality manufacturing.During the past 30 years, Keltron has churned out a whole range of electronic products,electro-mechanical and high precision modules and sub assemblies for different industrysegments. Over the years, Keltron has built up a strong infrastructure spread over 7,00,000 sq ft ofbuilt-up area. Equipped with computer-based facility for system design & engineering, and softwaredevelopment tools for embedded systems, Keltron today is fully geared to offerintegrated manufacturing solutions.